Right-wing trolls aren't harmless. 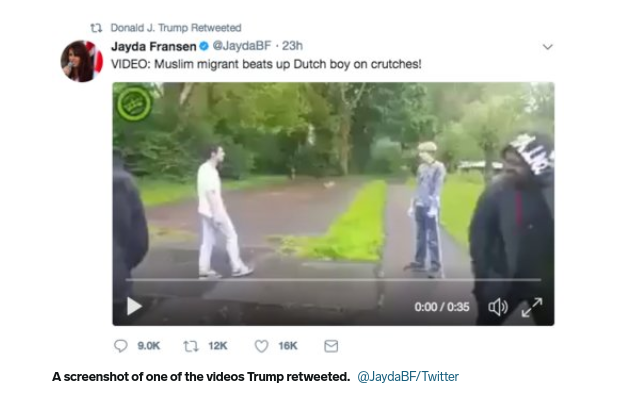 And Trump is the most powerful right-wing troll in the world. I went through 3,000 of Cesar Sayoc's tweets going back to Jan/2017 & it's scary how corrupted his mind was by every far-right conspiracy from Podesta child sacrifices, to Obama being a Muslim, to Pizzagate. Also noticeable how his rhetoric got more threatening as time went on. He was obsessed w/all things Trump. He went to multiple rallies, the inauguration, he visited Trump-branded properties. What’s interesting, is his rhetoric didn’t seem to turn toward ominous threats until early this year when he started targeting TV & CNN personalities, politicians, and others. Prior to that it was all conspiracy memes and photos at Trump properties/events mixed w/personal photos. There’s a real danger to the conspiracies out there especially combined with hostile and dehumanizing rhetoric. We saw it with the man who went Comet Ping Pong. People believe these things. So, I wanted to add to this thread, because I’ve been asked about it and our past reporting. There’s a sort of belief that these conspiracies just permeate dark corners of the Internet but it’s not true. People who shared these conspiracies made their way into the Trump Admin. William C. Bradford, Trump's appointee to head the Energy Department's Office of Indian Energy. He resigned when we reported he was a birther. Ximena Barreto, a HHS appointee who spread PizzaGate and the Seth Rich conspiracy theory. She resigned earlier this year. Todd Johnson, a Mattie side at Defense who resigned when we reported he posted birther conspiracies about then-President Barack Obama and shared a video that claimed Obama was the Antichrist. Ken Isaacs, his nomination for the top UN refugees post failed. He spread conspiracies that the Clintons killed people and shared InfoWars. That's just the beginning. Trumpworld is full of these conspiracy nuts. Of course, the president was the King of he birthers, so you'd expect nothing less. Michael Flynn and his son, both Don Jr and Eric Trump and the president himself have tweeted conspiracy theories, from the Pizzagate stuff to the Star of David over piles of money to just last week, Trump tweeted nonsense about the caravan being paid for by Democrats and he continues to hit George Soros in his speeches, even after the bomb was left at his house. This goes all the way to the oval office. But, of course, the damage was done. 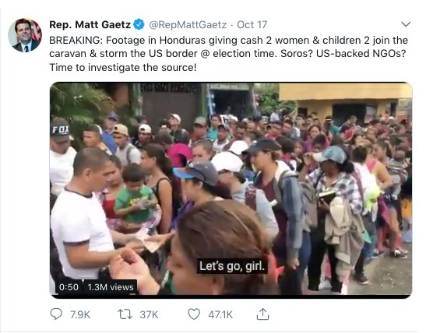 The President of the United States had passed it around and right-wing media used Gaetz's Soros claim to amplify it all over their social media and news channels. Yesterday, an anti-semitic monster shot up a synagogue, citing the caravan, because he believes Jews are helping "invaders" come into the country to kill "our people."